The three-day conference was successfully concluded with an agreement to collaboratively develop KFL textbooks, selecting me (Ho-min Sohn) as PI and director of the project. All participants were encouraged to participate in the development of the volumes in the areas (e.g., core texts, content texts, or the grammar/usage dictionary) of their preference. 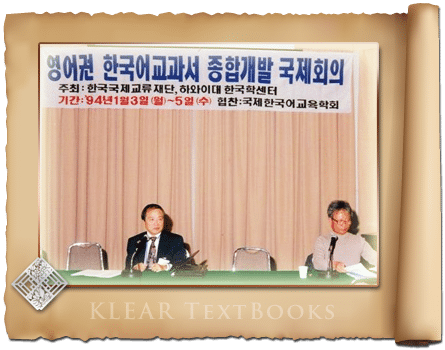 As a first step following the conference, I prepared an overall project proposal with a relevant budget and submitted it to the Korea Foundation in February 1994 on the basis of the discussions made and agreements reached at the conference. 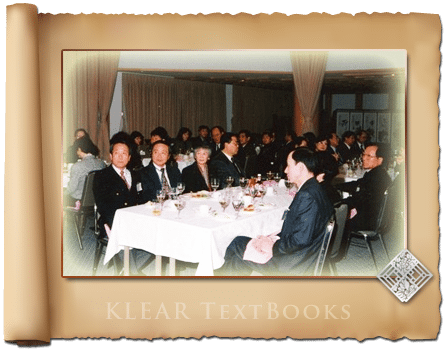 Then, per a suggestion by the Korea Foundation, the Korean Language Education and Research Center (KLEAR) was incorporated with the State of Hawaii in July 1994 as a legal international body to implement the project. Eight Board members of KLEAR were Ho-min Sohn (president, Hawaii), Dong-Jae Lee (vice president, Hawaii), Han-Kon Kim (auditor, Brigham Young), Choon-Hak Cho (ex off. member, president of the International Association for Korean Language Education, Seoul National), Ross King (member, London), Carol Schulz (member, Columbia), Pong Ja Paik (member, Yonsei), and Young-Mo Ahn (ex off. member, executive vice president of the Korea Foundation). Subsequently, a formal funding agreement between the Korea Foundation and KLEAR was concluded in July 1994 for detailed project implementation. The Korean Foundation and KLEAR agreed that the latter would develop a total of 13 books, including 4 core textbooks (beginning, intermediate, advanced intermediate, and advanced), 2 workbooks (beginning and intermediate), 5 content books (literature, selected readings, compositions, language and culture, and Chinese character reader), 1 teachers’ manual, and 1 grammar and usage dictionary. 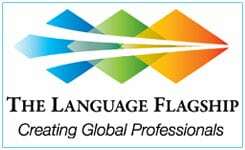 (For the details of the initial activities of KLEAR, please refer to Ho-min Sohn & Dong Jae Lee, eds., A New Frontier in Korean as a Foreign Language. Honolulu: KLEAR, 1995). In the course of field-testing the developed textbooks at several universities, a strong consensus emerged, that is, a main text and a workbook a year would not be sufficient; instead, a main text and a workbook per semester would be more appropriate. It was also suggested that two volumes of the high-advanced level be added. As a result, the project was revised to develop a total of 21 volumes, with the above recommended items incorporated. While the project was progressing, KLEAR president made contacts with the University of Hawaii Press (UHP) for publication of the books to be developed. As a result, an agreement was concluded among the UHP director, University of Hawaii president, KLEAR president and Korea Foundation president to the effect that all KLEAR book manuscripts to be developed be published by the UHP, provided that the manuscripts are recommended by anonymous peer reviewers. A total of more than thirty university faculty participated as co-authors in the project and developed manuscripts, revising them over and over again through try and error processes. Many other faculty members made comments on and conducted field-testing of the developed materials. Also, a number of graduate students participated in all processes and aspects of the project, working hard in helping the project activities. As a result, through a strict peer review process, the UHP began to publish KLEAR books in 2000, starting with Beginning 1. Some authors untimely passed away and others dropped off due to unavoidable circumstances. However, all those involved in the project bored all sorts of hardships to successfully accomplish their tasks. Moreover, the Korea Foundation staff, notably Director Ah-jeong Suh and Director Kyoung-Chul Park, who were in charge of the project, provided us with wonderful cooperation, guidance, and encouragement. I am indeed grateful to all of them for their dedicated work for the development of overseas Korean language education. As years pass by, more and more universities not only in English-speaking countries but also in Europe are using KLEAR textbooks. This is indeed a great thing to congratulate on. At the same time, it imposes greater moral responsibility on KLEAR. I sincerely wish that many capable, energetic, young Korean language scholars will join KLEAR not only to revise and improve the existing texts but also develop a variety of innovative teaching materials. Last but not least, the KLEAR project would not have existed without then Korea Foundation President Son Chu Hwan’s confidence, leadership, encouragement. I take this opportunity to deeply appreciate his far-sightedness as well as his strong decision and driving force.